SIERRA NATIONAL FOREST – On Tuesday, July 7, work began on the Soquel Bridge, located on Sky Ranch Road. Crews have removed the bridge and will work for the next few weeks to put in a new, double-wide bridge. 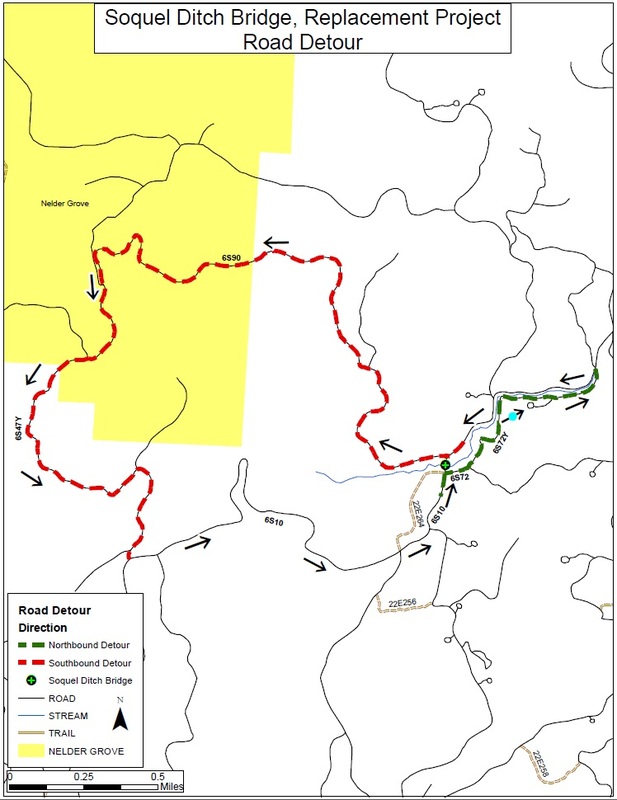 Detours are now in place for people entering and leaving the Sierra National Forest on Sky Ranch Road (see detour map below). When visitors are leaving the Forest they will be asked to take 6S90, better known as the Nelder Grove Road, back to Sky Ranch Road as a one-way detour. Visitors entering the Forest will be asked to take 6S72, also as a one-way road. These detours will be marked with signs for visitors unfamiliar with the area. Motorists are asked to maintain a slow speed when traveling these roads due to the increased number of vehicles using the routes. This closure will be in place for approximately two months while the bridge is being constructed.